Here’s a clever take on the vampire genre: the town of Barrow, Alaska, the most northern town in North America, suffers 30 days without sunlight each year. Sounds like a perfect winter retreat for vampires, doesn’t it? 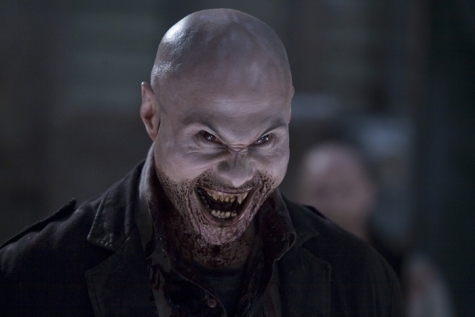 That’s the premise of 30 Days of Night, which is based on the graphic novel of the same name, written by Steve Niles. The movie, directed by David Slade (Hard Candy ), stars Josh Hartnett (Halloween H20 , Black Hawk Down ) as the small town sheriff who, together with his estranged wife (Melissa George), lead a small group of survivors of a vampire attack. The game for our protagonists, cut off from the outside world, is to survive for 30 days until the sun returns – an idea so simple for a vampire picture I wonder why nobody tried it before. The film plays loose with facts, of course – the real town of Barrow goes for 65 days without sun, with periods of twilight, but hey, who can survive 65 days of a vampire siege? The film starts out ominously, with an unseen character destroying cell phones, killing dogs, and sabotaging the local tour guide’s helicopter. A little slow, our sheriff hasn’t figured out that when somebody is trying to kill your communications, security, and transport out, it means batten down the hatches. Soon a threatening stranger (well played by Ben Foster) turns up and starts his new job as resident doomsayer, taunting Sheriff Eben’s family from the confines of his jail cell. Before you know it, the cell phone tower guy has his head stuffed on a pike and bloodthirsty vamps massacre most of the town (there’s a sequence shot from above of the carnage that is rather fabulous, reminding me of the beginning of Zach Snyder’s Dawn of the Dead). 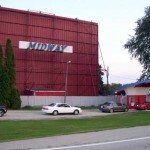 The movie’s strong point is atmosphere. There are breathtaking snow covered vistas occasionally punctuated with blood red. While certain action sequences shake a bit, they aren’t too distracting. Cutting his teeth on music videos, director Slade has a good eye for scene composition. The vampires themselves are a piece of work – nasty, brutal, and evil looking. They are single-minded and uncomplicated – there’s nothing “cool” about them (unlike in the Blade films), and they speak in a guttural, simple language. They have not been humanized; their facial features are warped and slanted to good effect (it makes sense that Slade did a music video for Aphex Twin, since the vampires’ appearance reminds me of the “evil” Richard D. James look from Come to Daddy ). There’s something a bit nihilistic about the flick too, reflected in the vampire philosophy. The lead vamp (Danny Huston) taunts a victim (“God? No God.”) and talks of life being only hunger and pain. Sorry, I was just thinking of this hilarious vampire joke. The movie isn’t without flaws. Its main problem is with pacing; when things should be ramping up, the movie chooses to meander. Shortening it by a half hour would have made it tighter and more focused, with a greater sense of urgency. I will admit to being a bit forgiving in this area, as I admired that 30 Days of Night treats the monster menace with more seriousness than its genre counterparts. Over the last few years we have been bombarded with vampire films having an attitude of camp (From Dusk Till Dawn ), comic book (Blade ), or teenage romance (Twilight ). I might call this film a more realistic version of the second half of From Dusk Till Dawn – the life-and-death concerns of Night of the Living Dead without Tom Savini’s crotch gun gimmick. Not that there isn’t room for all different takes, of course. Speaking of Twilight, it seems that Slade has been hired to direct Eclipse (AKA Twilight 3) for a 2010 release. It will be interesting to see how he handles the material.